2016 will be a great year for Littlest Sweet Shop. We are introducing 3 new menu categories including a Japanese menu where you can find sushi and bento sets! There will also be a new International menu that will have a mixture of everything! Of course this new collection will be introduced throughout the year. I'm also currently learning Japanese so that I can successfully communicate with our Japanese Littlest Sweet Shoppers. It's a tough language to learn but I will try my best! Our first post of the year will feature our new 2016 Valentine's Day collection. This time we have 6 brand new items for the collection and they are listed in our Seasonal menu. This year we also have a new girl joining us. Her name is Harumi and she's a Ruruko doll. She's an honorary Littlest Sweet Shopper helper and her pink maid outfit is almost similar to Akiko's. Our first new item is the perfect Valentine's Day gift (when paired with a bouquet of red roses). This Valentine's Box of Candy is made from polymer clay so you can request your own in any colour of your choice. The one being showcased here is in pink pearl with a white bow. This Box of Candy is so special because it comes with a dozen pieces of chocolate bonbons! Since we make everything bespoke, you can even select the type of bonbon that you (or the doll) prefer. The whole box is handmade with a fitted lid. Order yours in any colour! Next, let's add some new cookies to the collection. This time they are Artisanal Chocolate Cookies that are intricately designed using soft pastel colours. I have levelled up in making detailed micro designs so I used the tip of a needle just to model the flowers! Here is an update to the Heart-shaped mini cakes. This time, we only iced the top so you can still see part of the light fluffy sponge cake. Comes in chocolate and vanilla flavours. If you prefer something that is more plain and simple, grab a slice of Valentine's Pound Cake. Each slice is even iced and decorated with cute metallic hearts. The Double hearts chocolate and marshmallow pops is so tiny so you can use it for 1:12 scenes as well. Each pop comes in yummy chocolate fudge and has a layer of marshmallow on top of it. And our last item for this year's Valentine's Day collection is the heart shaped swirl lollipop. Just like our famous swirl lollipops but in a heart shape instead. The flavour is cherry red and ichigo pink! So sweet! 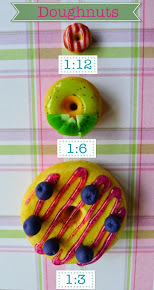 Lastly, here are 2 cute new doughnuts that I made during Christmas holidays. Since winter is the worst time to do photo-shoots (and the macro photography using my novice camera needs real sunlight), here they are at last! You can also find them in the Seasonal menu. Frosty is a sugar frosted doughnut with chocolate mouth and eyes and Rudolph is a PB & J doughnut with a red gummy nose and mini pretzel ears. Since Valentine's Day is only a month away, please make sure you order as soon as possible. The shop will be closed for the whole month of February until mid-March. Don't fret as the new Easter/Spring collection will be introduced in March after I get back. Me and my husband are going to the exotic islands near Borneo for a whole month to escape the cold and bleak English winter. That's all for now. I hope you like our new collection especially when there are so many new chocolatey treats! Please come visit again later next week for another Kawaii Box review! Kawaii Box Review and Give-away time!